The Tribunal participates in one of the Diocesan Bishop’s three powers, namely, his judicial power. The Bishop exercises this judicial power normally through a Judicial Vicar, Judges, and Defenders of the Bond, all of whom he appoints as officers of his Diocesan Tribunal. All officers of the Tribunal and others who hold positions connected with it, are bound to discharge their duties in conformity with the law of the Church (Canon law). 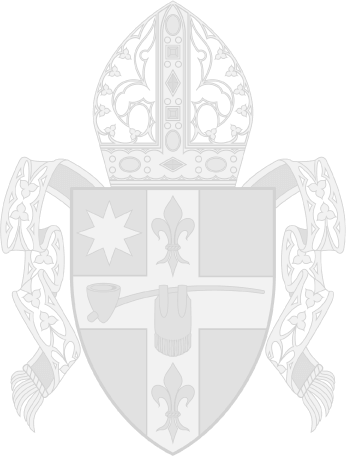 As the Tribunal works to administer the judicial authority of the Bishop, it also cooperates in administrative and other endeavors of the Diocesan Curia. One very important task of the Tribunal is to be a prudent and watchful guardian of the Sacrament of Matrimony when it is approached by those who petition for a Declaration of Invalidity of a marriage (annulment). Guided by the Code of Canon law and the proven jurisprudence of the Church, the Tribunal officers will do a thorough investigation of marriages which are believed to be invalid for various reasons. Only if sufficient proof is found that something essential was missing from the beginning can a marriage be declared invalid, which then allows a divorced person to enter a new marriage in the Catholic Church, or to return to the sacraments after having married civilly following a divorce. While not every failed marriage can be proven invalid according to Canon law, the officers of the Tribunal see their mission as doing all within their power to help Petitioners with their cases, to help them understand the canonical issues involved, and to give them some spiritual guidance. They are committed to their mission of contributing to the salvation of souls by their canonical work as well as their prayers. How do I initiate a formal case? 1. How can I initiate a marriage case? A marriage case can be initiated through a parish priest, deacon, or a notary/auditor. Those wishing to initiate a marriage case with a notary/auditor have the choice of meeting with a man or woman notary/auditor. The party initiating the case will be asked to meet with one of the above-mentioned persons who will help the party complete the application for the marriage case and to instruct him/her on how to complete the other required forms. These forms will then be sent to the Tribunal for consideration. A preliminary decision about the type of case (formal or informal) may be made at this time; yet the Tribunal will make the final determination. 2. What will be required of me when my case is considered? Since in formal cases the validity or invalidity of a marriage revolves around the moment of consent (exchange of vows) at the wedding, the Court will ask the parties to provide testimony regarding their family background, the courtship, the marriage, the breakdown of the marriage, and the period since the divorce. 3. What documents will be required for this process? The Court needs proof of baptism, a certified marriage certificate, and a certified decree of divorce, including settlement agreements and financial support of children. Also, if available, any counseling records, criminal/police reports, or pre-nuptial agreements would be helpful. 4. Who will be working with me on my marriage case at the Tribunal? The Tribunal is made up of the judges, the advocates, the defenders of the bond, and the notaries. The judges instruct the case and control the stages of the investigation and the gathering of the evidence, and will eventually make the decision regarding the validity or invalidity of the marriage. The advocates advise the parties whether their case has merit to present it to the Court. They help the parties to prepare the case and present it to the Court for assessment. The task of the defenders of the bond is to defend the bond of marriage. The notaries are responsible for providing an accurate written record of the case. The party initiating the marriage case is called the Petitioner and his/her former spouse is called the Respondent. 5. What will happen once my application for the marriage case is received by the Tribunal? The case is assigned a number, and the advocate will review the case. If necessary, the advocate will ask the Petitioner additional written testimony or request a personal interview. If the material appears to have substance, the advocate will write a petition which will be sent along with an appointment of advocate form to the Petitioner to sign and have notarized. When these forms are returned, the case is assigned to a judge. Each case is unique, but the average length of time to work a formal marriage case in the Peoria Tribunal is from one year to a year and a half after the case has been assigned to a judge, and depends on many factors. 7. How much will it cost, and what if I can’t afford to pay the fees? At present, the fee of the Tribunal is $550. Everyone has a right to have their marriage case reviewed by the Tribunal, and no one is refused because of their inability to pay. Arrangements can be made to pay their fees, and in cases where a party demonstrates he/she is unable to pay anything, the fee can be waived, if arranged with the Judicial Vicar. 8. Will I have to provide witnesses for my marriage case? Yes. The petitioner is required to contact family members and non-family members to get their permission to submit their names as possible witnesses. 9. What is the role of the witnesses? Witnesses are asked to describe the behavior of the two parties before and during the marriage. They may also be asked to report statements that the parties made. 10. Is the testimony kept confidential? The Law states that only the two parties can read the witness testimony. Under certain conditions, it may be possible to keep parts of the testimony confidential. The permanence of marriage and the indissolubility of sacramental marriage are central beliefs in Catholic teaching and law. While carefully protecting the teaching of Christ and the sacredness of marriage (Mt. 19:3-9; Mk. 10:2-12), the Catholic Church recognizes its obligation to assist persons whose marriages have failed so as to clarify their status in the Church. The question is: Are these people still bound to the former union, or are they free to marry again in the Catholic Church? In order to answer this question, the Church investigates marriages in a process which is commonly referred to as an “annulment.” The Tribunal of a Catholic Diocese is the Church’s judicial branch which studies such questions and renders decisions in the various types of marriage cases (cf. attached brochure on Grounds). The laws of a state and the Catholic Church both use the term “bond of marriage,” and both hold that the bond is “permanent,” inasmuch as the parties themselves cannot dissolve it. For a state, however, “permanent” means the bond continues until the state determines it is dissolved. For the Church, it means the bond of a valid marriage continues to exist until the death of one of the parties. Due to Christ’s teaching that “what God has joined, no one must separate” (Mt. 19:6), divorce is not accepted in the Catholic Church. Although Catholic marriage Tribunals use the term “annulment” as a convenient term to describe their formal investigations of marriage, this term does not accurately describe their activity. Tribunals do not dissolve a valid marriage, but rather declare that a marriage was invalid from the beginning because something essential was missing from the marital consent given at the wedding, even though this was not apparent at the time of the wedding. Therefore, the proper term for a Tribunal’s affirmative decision is “Declaration of Invalidity,” which is the result of a thorough investigation, and states that, despite years of common life and children, the marriage was never fully valid according to Catholic doctrine. However, there are also marriages which cannot be declared invalid because they are not invalid, and then a negative decision is rendered to the person seeking the annulment. It is not true, as so many people still believe, that a Declaration of Invalidity will make any children born in the marriage illegitimate; neither the civil status of the children nor the terms of the civil divorce are affected in any way by such a Declaration. Church and state laws are strictly separated in the United States. The Tribunal procedure is purely religious in nature, and its sole purpose is to clarify a person’s status in the Catholic Church; i.e., to determine whether a person is free to remarry in the Catholic Church. It is also not true that the Catholic Church considers marriages invalid if they were not celebrated in the Catholic Church, or at least in some Church. Since the Catholic Church sees marriage as based in natural law, it recognizes any marriage celebrated according to the law of any state or any other religion as naturally valid. While baptized Catholics must follow the canonical form of marriage in order to marry validly, this does not apply to anyone else. A decision in a marriage case takes time, and is made only after the matter has been thoroughly investigated. When you, as the Respondent, are first contacted by the Tribunal about a case, the Tribunal is just beginning its investigation, and no decision has yet been made. You will certainly be informed of the final decision at a later date, and you have every right to participate in the process. As a matter of fact, the Tribunal welcomes your participation, since our goal is to find the truth about your marriage and to determine whether or not something essential was truly missing in your marriage. If such an essential lack cannot be proven with moral certainty, the marriage cannot be declared invalid. What is a Decree of Invalidity? 1. What is a Christian Marriage? According to Vatican Council II, marriage is an intimate partnership of married life and love which was created by God and qualified by His laws. It is through a mutual exchange of consent between a man and a woman that the irrevocable conjugal covenant is established. Marriage as created by divine will and celebrated publically in the eyes of society is a lasting union which is for the good of the spouses and their offspring. 2. What is a Declaration of Invalidity? A Declaration of Invalidity is a judgment made by a Church process which declares that a marriage apparently did not fulfill or include one or more of the essential elements of a valid sacramental marriage. These elements include: permanence, fidelity, partnership, and openness to children. 3. Should divorced Catholics still participate in the sacraments of the Church? Yes. A divorced Catholic who has not remarried is still a member of the Catholic Church in good standing and can participate in the sacraments of the Church. 4. Should divorced and civilly remarried Catholics still participate in the life of the Church? Divorced Catholics who are civilly remarried are still members of the Church. They are, however, not able to participate in the sacraments (Eucharist, Reconciliation). 5. Why can’t divorced and remarried Catholics receive the Eucharist? Unless the divorced and remarried Catholic has received a Decree of Invalidity for their earlier marriage(s), they and their Catholic spouse cannot participate in the Eucharist because the new marital bond is considered to contradict the validity of the first marital bond which the Church is obliged to protect. 6. When is the best time to apply for a Decree of Invalidity? This varies according to the needs of the individual. If a person has recently been divorced, they may be still experiencing the grieving process and may not as yet have come to terms with the fact that the marriage has ended. Thus, it may be too early. However, if one or both of the parties plans to remarry soon, the parties may not want to wait and should initiate a case as soon as possible. 7. Does a person need to apply for a Decree of Invalidity if he/she does not plan on remarriage? A person never knows what life will bring, and even though the person does not plan on remarriage, this may change in the future, and plans may have to be delayed or changed because a Decree of Nullity will be needed. The process can also be seen by both parties, if approached in the right spirit, as a means of healing and going forward with their new lives. 8. Who should apply for a Declaration of Invalidity? Either spouse of a marriage who feels a need for a Declaration of Invalidity can apply. The person who is initiating the marriage case is the Petitioner, and their former spouse is the Respondent. 9. Will my former spouse be contacted? Yes. Both parties were a part of the marriage, and both parties have the right to know that a Decree of Invalidity is being sought. While one party is initiating the marriage case, their former spouse has a right of defense on their own behalf. It is also in the best interest of justice to have the full story regarding the marriage from both parties. 10. What if my former spouse will not cooperate? The former spouse will be contacted and invited to participate in the process, and if they should not choose not to participate, the case will still go forward in the process. 11. Will I be asked to confront my former spouse? Although the party initiating the case is required to make a serious effort to locate and provide the Court with their former spouse’s present name and address, they will not be asked to confront him or her. Interviews for the spouse are set at different times. 12. What if I don’t know where my former spouse is? The Petitioner has the obligation to find the Respondent by whatever means are available, but if no address is known, the case will go forward. 13. Is the purpose of this process to judge my former spouse and myself? No. It is not the Tribunal’s aim to carry out any type of moral judgment regarding who is right or wrong or who is innocent or guilty. It is the aim of the Tribunal to decide whether any essential element is missing in this marriage which could then prove the marriage not fully valid. 14. Does the Decree of Invalidity mean that children from my marriage are illegitimate? No. A child is legitimate as long as the parents were married at the time the child was born, or even if they married after the birth of the child. 15. If my husband/wife has been previously married and divorced, but he/she is not Catholic, do they have to apply for a Decree of Invalidity before we can have our civil marriage validated? Yes. The Catholic Church considers all marriages valid because of natural law. Therefore, all marriages are considered naturally valid. 16. Does a Decree of Invalidity mean that I am free to remarry or have my present civil marriage validated? In some cases, additional instruction about Catholic Doctrine of Marriage is required. In other cases a prohibition may be placed on one or both parties. 17. How can the prohibition be lifted? The Tribunal Judge needs to receive a report and be satisfied that the previous condition(s) no longer exist. For details, please contact the Office of the Tribunal. 18. What is the procedure for remarriage or the validation of my civil marriage once the Decree of Invalidity has been granted? The Decree of Invalidity requires an affirmative decision both in the First Instance Court in Peoria and in the Second Instance Court in Chicago. Once this has been obtained, the parties must meet with the parish priest who will be preparing them for their marriage/validation. The couple must undertake the same preparations as anyone wh is preparing to be married. However, the documents of the previous marriage, as well as the Decree of Invalidity must be included in the Prenuptial File, and if the parties have been in a civil marriage celebrated outside the Church, the Catholic parties must celebrate the Sacrament of Reconciliation. 19. What if I receive a negative decision at the conclusion of the marriage case process? If a negative decision is given, the Petitioner is encouraged to talk with their Advocate at the Tribunal. A negative decision can be appealed. Anyone who has questions regarding the Office of the Tribunal, a possible marriage case, or suggestions for recommended reading regarding this topic, may call the Office of the Tribunal at 309-671-1550 Monday through Friday, 8:30-4:30. The Peoria Tribunal has Notary-Auditors in all the Vicariates. Notary-Auditors are laymen, women, and Deacons who have been trained by the Tribunal to help people initiate a case. Click here for a list of names and phone numbers for each Vicariate. For additional names, please contact the Office of the Tribunal.